I recently trained many of our leaders on Monkey Management. I’m convinced that this principle is the #1 cause of death in new leaders. 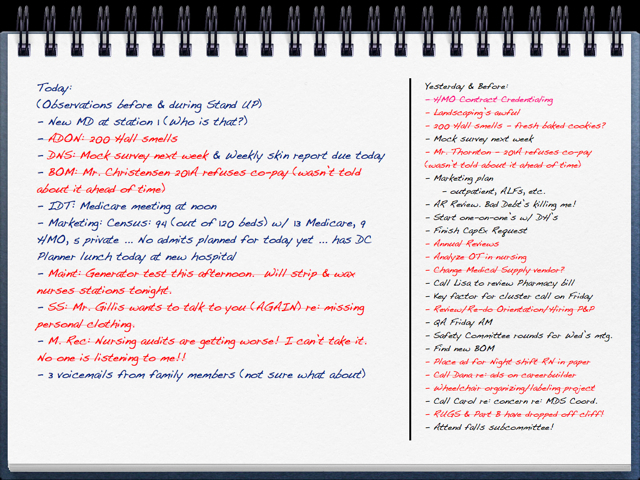 Take a minute to look at this To-Do List. It’s not uncommon from many leaders’ lists. 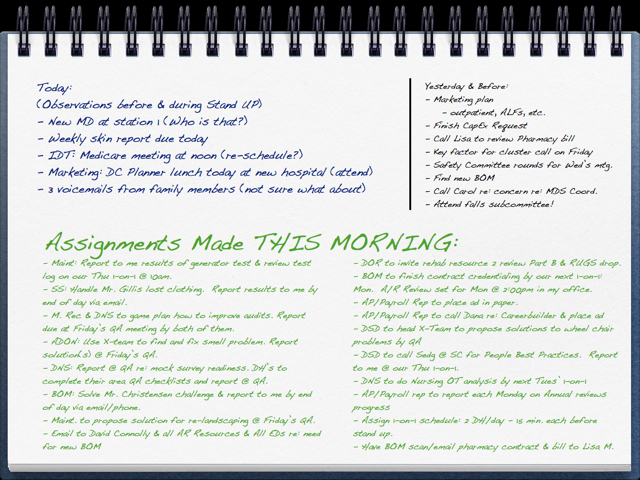 It contains things that came up today (on the left) and things to do from yesterday and before on the right. Normally, one’s list is spread out on Post-it Notes, 3×5 cards, Notepads, Computer To-Do lists, Calendars, and email In-boxes. If you are doing work others could/should be doing, then you are, by definition, NOT DOING work that only you can do. Monkeys keep you from working on what Steven Covey illustrates so masterfully in 7 Habits of Highly Effective People as Quadrant III stuff (next slide below). 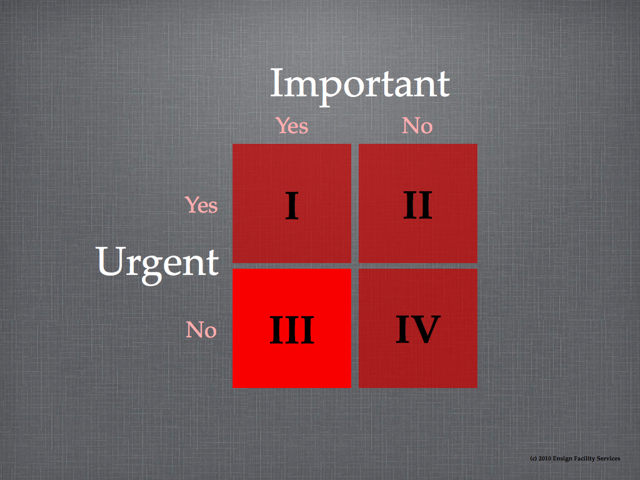 The Non-Urgent/Important quadrant of our to-do list. Regardless of your motive, you are stunting your direct reports’ ability to grow and develop by doing things for them. Stop it! Let’s see if they can sore. If they fail (which is practically guaranteed eventually), teach them and help them grow. 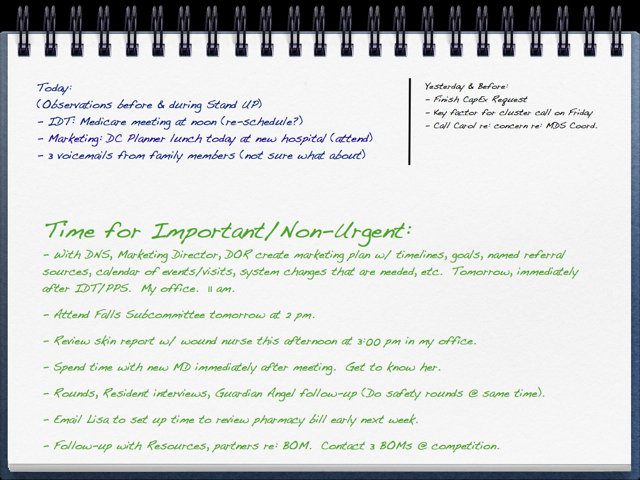 Take your ‘Total Plate’ which, again, includes your to-do lists, post-it notes, voice mails, emails, projects, etc. and strike a line through everything that doesn’t ABSOLUTELY have to be done by only you. 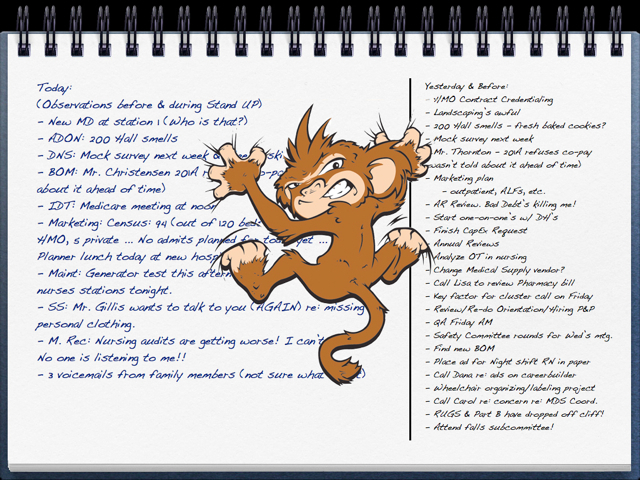 Look at my list below and notice in the next 2 slides how I identify other people’s monkeys that landed on my back and how I returned them to their rightful owner. What can you – AND ONLY YOU – do? Wow. Compare my list now (below) to my original list. FREEDOM! Freedom to finally lead. Freedom to run my operation instead of being run by it. If you don’t take a stand against monkeys and commit to a discipline of spotting them before they land on your plate and deflecting them, you will NEVER get to quadrant III. If you’re too busy for quadrant III then, SOONER OR LATER, you will fail. You will get burned out. You will be frustrated. You will remain miles away from your potential. One last thought about Monkeys. They hate you. They will only be happy when they not only destroy your professional life, but your personal life as well. Talk about Non-Urgent/Important!? : date night with your spouse, being home for dinner with your kids/family, family vacation, personal fitness/health, reunions with friends, community/church service, etc. All these things are, to a degree, sacrificed when we lack the discipline and understanding to treat monkeys as the enemy they are. You could have all the talent, charisma, & smarts in the world. But, none of that matters if you’re spending 75% of your time on monkeys others should be doing. Managers Do Things Right. Leaders Do The Right Things. Take Monkeys personally. If they could, they would spit in your mother’s face. So the big question … are those legit? They may be true. But that’s irrelevant. They are self-deceiving, self-aggrandizing excuses for not doing your job as a leader. Your job is NOT to do everyone else’s work. Your job is to assemble, inspire, measure, coach, and train leaders who can take your shared vision to produce incredible results. Dave, you don’t get it. I’m a servant leader. I don’t ask them to do anything I wouldn’t do myself. Dave, you don’t understand my team. We have some serious weak links right now and if I didn’t take on this stuff (that they should be doing) it wouldn’t get done. I do get it. And, I do understand your team. Perfectly. I understand the stress, the frustration, the underachievement, etc. And, I’m telling you, you’ve got to wake up and do your job! One of the reasons this is so tough for newer leaders, in particular, is because we feel so much insecurity during the beginning of our leadership. There’s so much we don’t know. And, everyone knows it. Since we don’t have the instant credibility that years of doing this provides, we try to gain it the only we know how … becoming superman for our staff. Dave, we need a HMO contract with XYZ company. Can you get one for us? Sure! Dave, I’m having problems with 2 of my staff. Can you talk to them for me? You bet! Dave, we need some new landscaping out front. What do you think? I’ll go to Home Depot! What’s the problem? Every one of those things (and probably 50% of your to-do list) are things your people should be doing. After a few years of struggling to become superman for my staff to make up for my own incompetence and lack of experience, I finally took the leap of faith to adopt the mind set taught by Bill Oncken, described as Monkeys. I’ve posted here a long excerpt of Oncken teaching it himself. 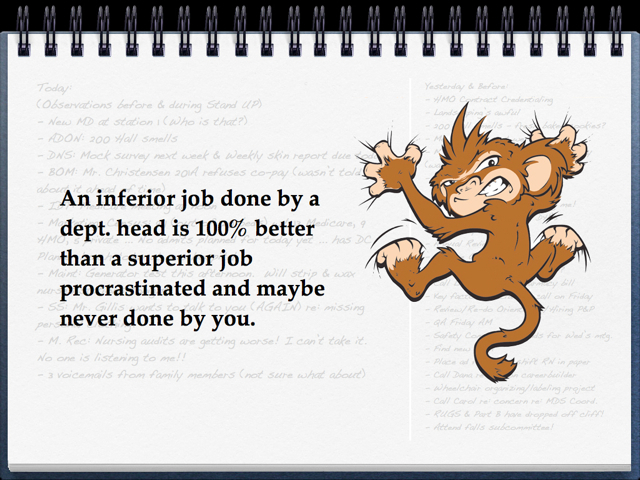 An inferior job done by your subordinate is 100% better than a superior job procrastinated by you and never done. If you don’t complete a task you’ve given yourself (or accepted to do for your subordinate), it’s called … procrastination. If you don’t complete a task your supervisor gave you, it’s called … insubordination. 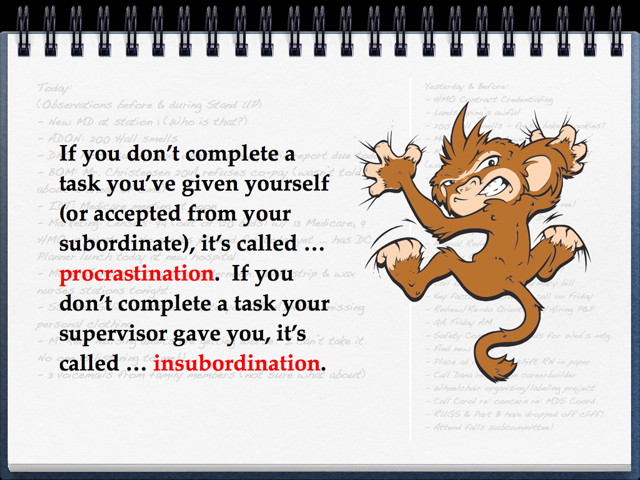 So, if there are tasks (monkeys) on your to-do list that have been there for a couple weeks that you haven’t had time to get done (procrastination), give it to your subordinate so it becomes insubordination if it doesn’t get done. Guess what. It will get done. This is not a lazy or selfish act. I had an allergic reaction to this talk of ‘subordinates’ and insubordination, and giving people work that I normally did. But, then I woke up. It empowers them! I pushes them to grow. It removes you as the constraint in your operation! Progress speeds up. Change happens. Because your doing your job … not theirs! It saved my career. I hope you can make time to listen to it.